This post is about intentionally using riding skills to target your riders’ life goals. This concept was introduced to me by the evaluator Sandy Webster at the Advanced Workshop I attended at Heartland Therapeutic Riding. It is perhaps the most impactful concept I learned from the week, as it has changed my perspective on instructing for therapeutic riding and given me direction for improving my lessons and their benefits. This may be long but it’s totally worth the read. Disclaimer: Keep in this is based on a lecture given by Ms. Webster and I am extremely grateful to her for agreeing to let me share the material I learned at the Workshop with all of you. That said, these are from my notes, and probably not a perfect representation of her material, but I hope it gets the point across and is helpful! Registered Level Certification was only meant to be a stepping stone. 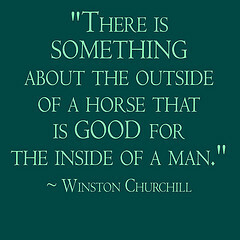 As a PATH Intl Registered Level Insructor, you are getting comfortable with the basics: the lesson plan components, teaching the what’s how’s and why’s of riding skills, arena management, safety measures, teaching techniques, giving feedback, and using the natural benefits of the horse and environment for your riders. Advanced Level Certificationtakes it to the next step. Now that you are comfortable with all the above, you start to specifically pick lesson aspects (skills, movement, volunteers, environment, etc.) to improve and enhance daily life functions, meet Life Goals, and change lives on purpose – so they can go home and replicate riding skills to use in everyday life. The following steps help you determine what Riding Skills to use to reach Life Goals. Consider the rider’s Life Goals. Choose Riding Skills that have similar components and therapeutic value toward the Life Goals. Create Riding Goals and a Lesson Plan that intentionally incorporate all factors (arena setup, environment, volunteers, tack, etc.). The following breaks down the components of each step. Life Goal: Hygeine –> Components: brush teeth, bathe, wash hands, brush hair, etc. Life Goal: Feed self –> Components: use utensils, etiquette, use napkin, hold cup, know right/left, use hands independently, etc. Life Goal: Read –> Components: focus, sequence, follow directions, processing, sit quietly, problem solving, memory, critical thinking, decision making, etc. Life Goals = Long or short term achievable life skills that come from the rider or parent. riding skill = the purposeful intention of using aids (hand, seat, voice, leg, weight) to communicate with the horse directly. We say “intention” because not all riders may actually be able to communicate their intention to the horse effectively, but the rider’s intention is there. For example, the aid for “walk on” could be leg aids (which is effective because the horse feels it) or making the sign for “walk on” (which is not effective because the horse won’t respond unless the leader supports the rider, however the rider’s intention is still there). Note a riding skill is not the aid itself, or riding through figures, although it usually involves the application of aids. example: MJ will demonstrate posting trot down the long side of the arena 2x in each direction, assistance as needed. I hope that all makes sense! 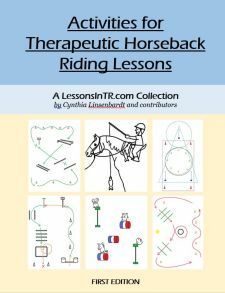 I thought is was so inspiring because after all my focusing on riding skills, it taught me how to get to the reason we instruct therapeutic riding – to purposefully change lives!